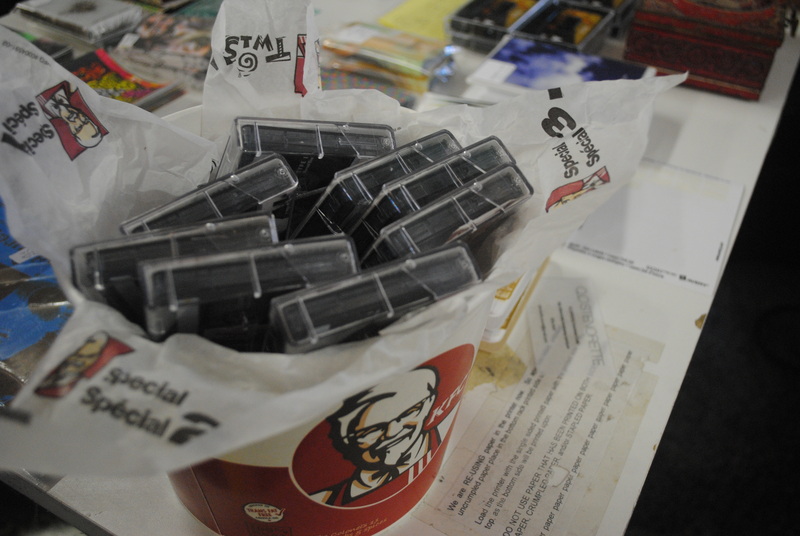 On Sept. 7, a hefty serving of audiocassettes filled a KFC bucket to the point of overflow atop a table in the Annex location of Toronto record supermarket Sonic Boom. Ripe for consumption and low in calories, what’s been dismissed by some as a stale format for decades, the audio cassette has seen something of a revival amongst recording artists in recent years, this year prompting an inaugural, international celebration of the medium – labeled Cassette Store Day (hence the format’s prominent situation at Sonic Boom on the Saturday). While Sonic Boom’s locations are most revered for the breadth of music they offer consumers through vinyl media, its Annex shop spent the day housing a “Cassette Fair” at the front of its store featuring offerings from cassette-release toting labels Arachnidiscs, Artificial, Awesome Tapes From Africa, Bennifer Editions, Burger, Buzz, Daps, Feather Hat Guy, Healing Power, Heretical Objects, Hosehead, Inyrkdisk, Kinnta, Mathematic Recordings, Medusa Editions, Not Unlike, Optical Sounds, Pansy Twist, Pleasence, Reel Cod, and Telephone Explosion. Also tabling at the event were representatives of renowned indie music website Weird Canada, a publisher about to get behind cassettes in a big, $50,000 way. After a stressful grant application process that had Weird Canada Executive Director Marie LeBlanc Flanagan up late writing (and rewriting) a proposal to the Foundation to Assist Canadian Talent on Records (FACTOR) on Valentine’s Day earlier this year, in the spring, Weird Canada was informed it would receive a $50,000 FACTOR grant to build an online store and distribution service. “Basically what we’re going to try to do is connect record stores with bands, with fans, with labels, and send these cassettes all over Canada,” Flanagan told Burden of Salt while taking time out from speaking with consumers and those curious about the table she was working at the fair. “Well, I feel that we as a culture, and our generation, really desire a physical medium,” said Flanagan. Speaking on the subject at a bustling record store, it was a suggestion that preached to the choir, but it didn’t yet clarify why people should be interested in what some now call an archaic recording medium. Flanagan went on to explain that people should look to cassettes because they open doors for artists that other physical media cannot. In deed, Weird Canada founder Aaron Levin has had some personal experience dealing with pressing records to vinyl. Putting its money where its mouth is, Weird Canada will even roll out some cassette releases. After recording a Wyrd Fest showcase the publication threw at Toronto’s Music Gallery, the website has been granted release permissions from the venue to sell 100 cassettes of the concert, which featured performances from Jennifer Castle and Colin Bergh covering each others’ material, Zachary Fairbrother Feedback Guitar Orchestra, and Soul Sisters Supreme. They also have a project called The Weird Canada Releases, which will give rise to some cassettes. While some have railed against the reemergence of cassettes as signaling cultural decay favouring an inferior recording medium and consumer exploitation, pointing to how less of the information recorded in a studio can be heard from cassettes when the medium is held against other formats like vinyl, Flanagan and Levin stand by the medium and say the “audiophile” argument is pushing a moot point. The argument also falls victim to deflation when it is brought up that most contemporary cassette releases come packaged with download cards linking the purchaser to digital recordings of the same music. “I think people want things to sound good, but most importantly they want the result of their creative expression to exist in the world and to be enjoyed by people. And tapes are right now the best format through which to do this,” said Levin. Weird Canada’s distro is set to arrive in January 2014. This entry was posted in Burden of Salt and tagged Aaron Levin, accessibility, audio, audiophiles, Canada, cassette costs, Cassette Fair, Cassette Store Day, cassettes, Colin Bergh, distribution service, distro, download cards, FACTOR, FACTOR grant, Foundation to Assist Canadian Talent on Records, independent musicians, indie music, international cassette store day, Jennifer Castle, Marie LeBlanc Flannigan, Music Gallery, online store, recording, records, Sonic Boom, Sonic Boom Annex, Soul Sisters Supreme, technology, The Weird Canada Releases, Toronto, vinyl, Weird Canada, Wyrd Fest, Zachary Fairbrother, Zachary Fairbrother Feedback Guitar Orchestra on September 11, 2013 by Tom Beedham.